VDEX is our distributed, decentralized digital assets exchange. 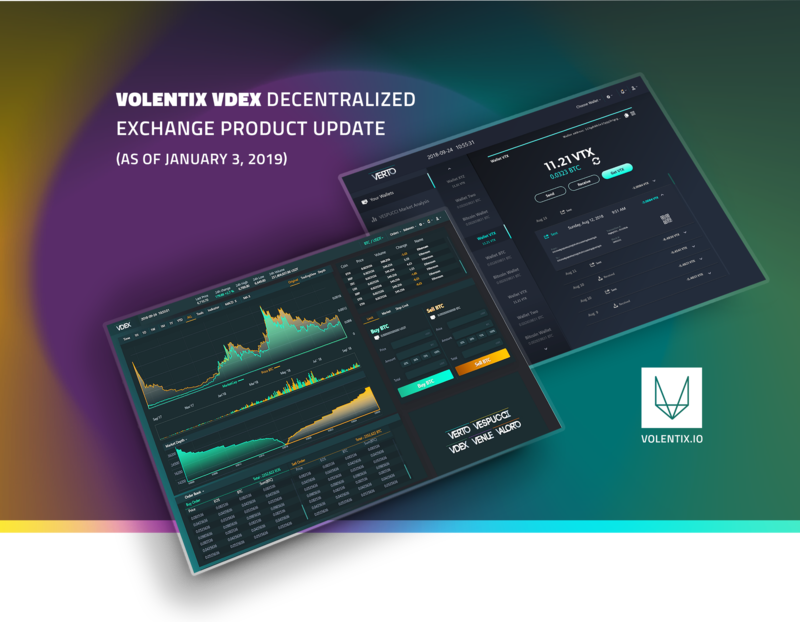 Essentially inseparable from VDEX is our multi-currency wallet VERTO, which you are welcome to download free of charge by visiting our website at volentix.io. The idea of creating a decentralized exchange emerged from the need to solve the inherent weaknesses of centralized exchanges. Expensive fees, transaction delays, and extensive portfolio losses caused by hacking attacks and insider fraud — these factors have led many users to abandon the digital assets space entirely. This problem demands an effective solution. The answer to such woes is a decentralized exchange paired with a wallet that permits local management of keys. Peer-to-peer transactions eliminate the middlemen. Users need not commit their assets to the tenuous custody of central operators. Your VERTO wallet allows you to locally manage your private keys and to effectively retain custody of your assets. VDEX enables cross-blockchain communication; for example, you can exchange a digital coin or token such as Bitcoin or EOS for our native digital asset unit VTX. We engineered this platform on existing open-source technology from EOS.io in order to allow our users to download the ledgers of supported blockchains with which our users choose to interact. Volentix makes a particular point of conserving and managing early financial support for the project (and significantly accelerating project development) by taking advantage of certain available open-source technology with which we are building the digital assets ecosystem (DAE) we ultimately envision to support an empowered and independent decentralized socio-economic community. We are utilizing existing EOS.io architecture to construct smart contracts fulfilling fundamental VERTO and VDEX functions, including maintaining balances and order records, setting “commit states” for order validation, signing transactions, and creating EOS public keys for recognition across blockchains. For those familiar with conventional stock market trading, we expect the user experience with VERTO and VDEX to be easy and seamless. We recognize how important it is that user experience be as close to zero resistance as possible. For example, users will be able to surf an inter-blockchain order-book browser to assess opportunities to place both market orders and limit orders in the same facile way as one-touch stock trading platforms have offered for decades. But with VDEX and VERTO, the user is in control. Buyer and seller interest is “matched” by accessing relevant blockchains, pairing buy and sell orders, and implementing them by atomic swaps. This methodology involves Hashed TimeLock Contracts (HTLC) to produce a timed hash sequence to protect or “lock” (and then unlock) assets on both sides of peer-to-peer transactions. We also employ random timeouts to enhance security. The VDEX solution has obvious implications for enhanced access, authentication, speed, security, stability, and liquidity. Please regularly visit our website volentix.io for future updates on VDEX and our other core products.